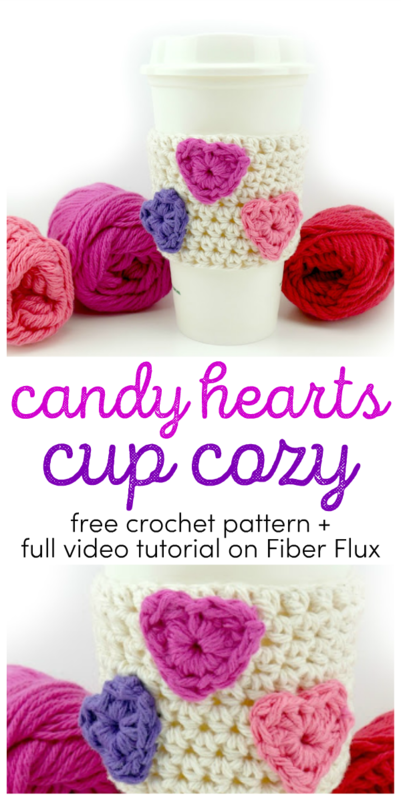 Fiber Flux: Free Crochet Pattern...Candy Hearts Cup Cozy! Free Crochet Pattern...Candy Hearts Cup Cozy! 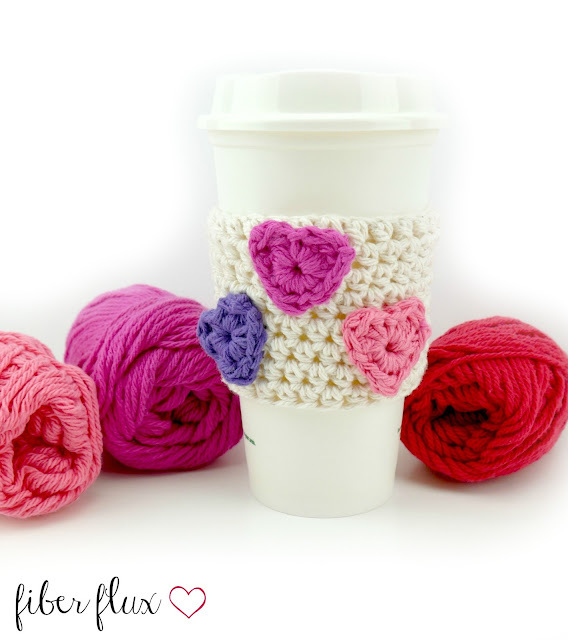 The Candy Hearts Cup Cozy is a perfect little gift to yourself or for your favorite coffee or tea lover too! A simple cup sleeve is embellished with simple one round hearts...add as many as you like! This is a great way to use up some yarn leftovers too. Get cotton yarn for this project here! Round 1: ch 2, then work a hdc in each ch. Join with a sl st to close round. Round 2: ch 2, then work a hdc in each st. Join with a sl st to close round. Repeat round 2 six more times then fasten off. Round 1 (work all stitches into center of the ring): dc, tr, dc, sl st, dc, tr, dc, sc, sc, sc, tr, sc, sc, sc, join to close heart and fasten off with a tail about 6-8 inches long, you can use the tails to sew hearts on later. With a tapestry needle, sew hearts to cup cozy using the tails. It helps to arrange them on the cozy first to determine placement. Weave in any ends that remain and you're finished!